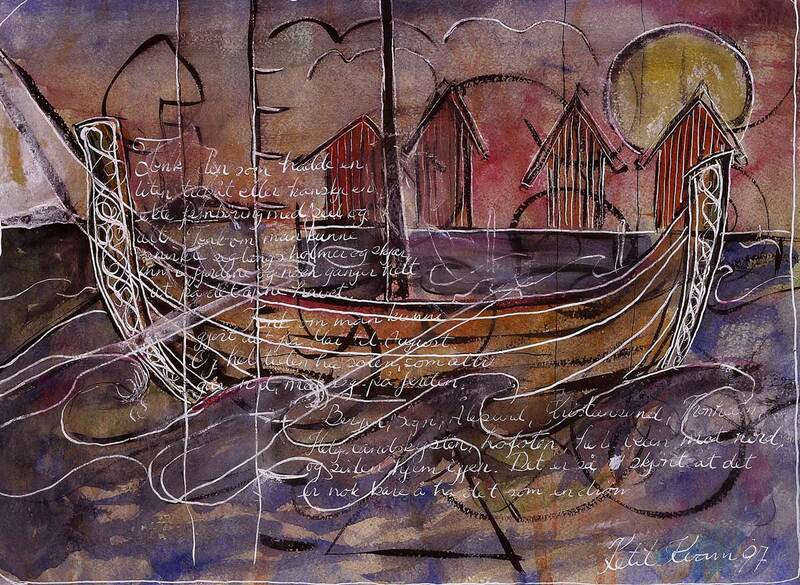 This is a watercolor of a traditional type of boat from northern Norway. It was painted in 1997 It has a text : "Imagine you had a little wooden boat or maybe a real "femböring" ( type of boat ) with sail . Imagine if you could sneak among islets and reefs, into the fjords and sometime out on the open ocean. Imagine you could do that from may to september, and all the time have the sun that never sets as your companion on the journey. Bergen, Aalesund, Kristiansund, Trondheim, Helgelandskysten,Lofoten. All the way up north... and then back again ! It is such a beautiful thought that it is enough to have it as a dream!"